Before moving on with any more lessons, let’s pause for a beat and take stock of the tatting terminology I’ve been throwing around. Here is a quick primer of the terms I’ve used so far in the Absolute Beginner Tatting Series, and a few related terms you’ve probably come across. Ball Thread. When working with a single shuttle, you will sometimes leave the thread attached to the ball and use that as a second source of thread. The shuttle thread (see below) will make the rings, and the shuttle and ball thread together will make the chains. The ball thread is also the working thread (see below). Chain. A row of double stitches. There are various types of chains, but they are all made with two threads, one forming stitches around the other. How to make a chain. Double Stitch. The primary stitch used to tat, which is basically a half hitch knot. As the name suggests, it is made in two parts, the first half and the second half, that together make the double stitch. How to make a double stitch. Flip. The process of transferring the stitch from the working thread to the shuttle thread. Also called the stitch transfer, the pop, or the hardest part of tatting. How to make a double stitch. Join. Hooking together two elements, usually by a picot. How to make a join. Needle. A long, thin needle that thread is wrapped around in order to form stitches. The needle is a fairly modern addition to the tatting repertoire; traditional tatting uses a shuttle to form the stitches. Needle Tatting. The process of making tatting using a needle (instead of a shuttle). Many people find that needle tatting is easier to learn than shuttle tatting, but gives the finished piece a slightly more “bulky” or “chunky” look since the stitches are formed around the needle instead of the thinner thread. Picot. Pronounced “pee-koe.” |ˈpēkō| A little loop made between two double stitches, used frequently as a frilly decoration or to join two elements together. How to make a picot. Ring. A set of double stitches in a circle or teardrop shape. 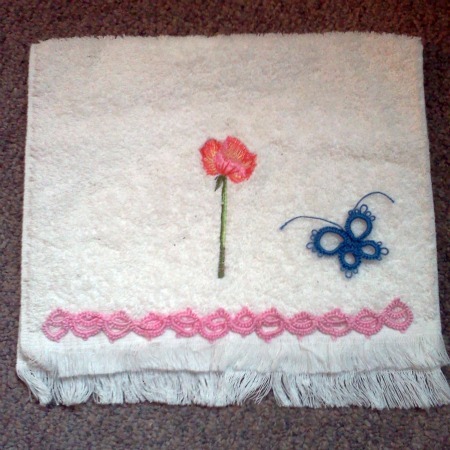 Made with a single thread, in which the double stitches are formed around a looped thread, and then the extra thread is pulled out leaving just the stitches in a circle. How to make a ring. Shuttle. A small tool that tatters use to guide the thread while tatting. While not, strictly speaking, necessary–you can move the thread with your fingers–using a shuttle is a whole lot easier than trying to manhandle the thread. Shuttles can be made of plastic, wood, metal, ivory, bone, mother of pearl, ceramic, or just about anything, and come in a few styles. Many avid tatters develop a personal relationship with their favorite shuttles. Shuttle Tatting. The process of making tatting using a shuttle (instead of a needle) that is wrapped in thread to guide the thread into patterns of knots to create rings and chains in delicate designs. This is the traditional method of tatting. Shuttle Thread. When making double stitches, this is the thread that comes off your shuttle. Tatting. Tatting is an ancient form of lace making, frequented by upper class ladies due to the enormous time involved. Notably, Queen Victoria of England and Archduchess Maria Theresa of Austria enjoyed tatting. Working Thread. 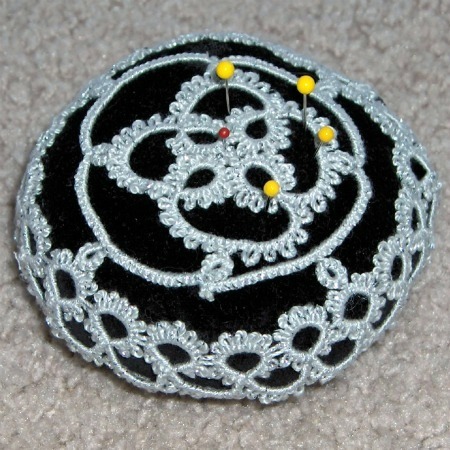 This is the thread around which you are forming the double stitches in shuttle tatting. It is the thread that goes over the back of your hand when making a chain, or around your hand when making a ring. This post is part of a series of Absolute Beginner Tatting Lessons. Go back to the previous lesson, Tatting Vocabulary Primer, or jump ahead to the next lesson, How to Join to a Picot. Don’t forget to enter my Tatting Toolkit Giveaway before midnight, August 31st! Hi, a normal ring is when you start at one point and your thread makes stitches around in a ring and you finish back at the same place we started. A split ring is when you start at one place and use two shuttles to make each make half of the ring separately, and then they come together at the opposite end from where you started. I am planning on making a video showing how to do this at some point, but it probably won’t be for a while.